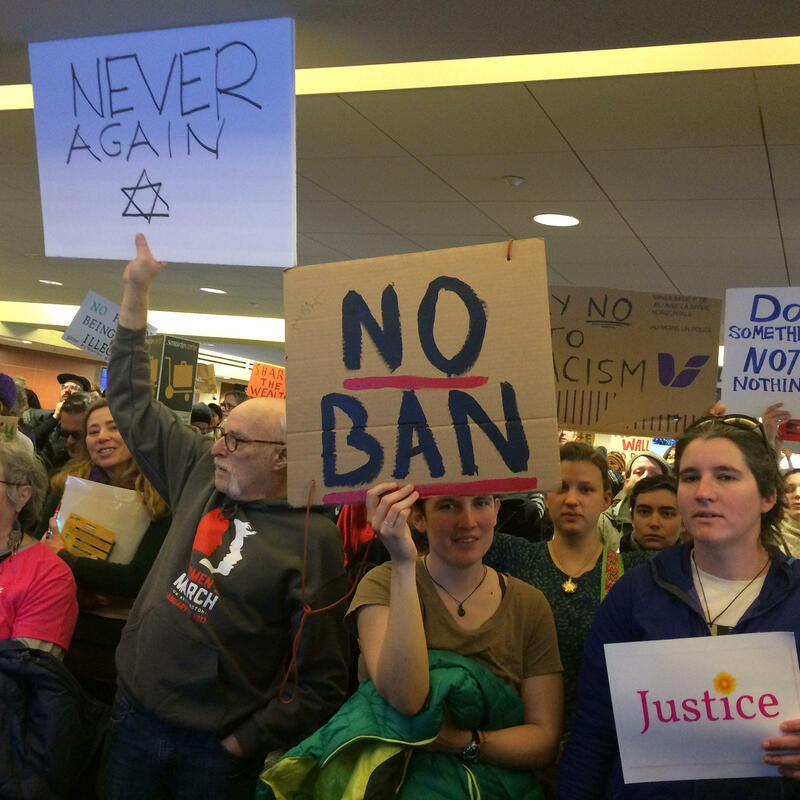 Hundreds of protesters pack the Portland International Jetport Sunday to protests President Trump's refugee ban. 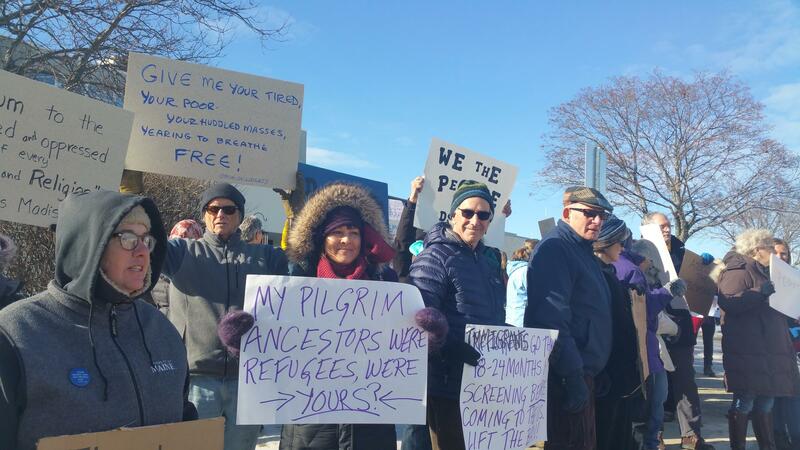 More than 1,500 people gathered at the Portland International Jetport Sunday afternoon, joining pop-up protests at airports and on public squares around the country designed to show support for refugees in the wake of President Donald Trump's executive order. The order, signed Friday, bars citizens from seven Muslim-majority nations from entering the United States for 90 days and suspends entry to all refugees for 120 days. On Saturday, a federal judge temporarily blocked part of the order, at the request of the American Civil Liberties Union, saying that individuals who arrived in the U.S. after it was issued could not be deported. Hours later, the Department of Homeland Security said it stood by the order and would continue to follow it. Later, White House officials said those with green cards would not be banned. Alison Beyea of the ACLU of Maine told the crowd that her organization will "hold the administration accountable when it attempts to bring unconstitutional illegal challenges to this country." And Portland Mayor Ethan Strimling said, "As mayor I need people to understand that refugees will be welcome here as long as I'm mayor of this city. And having everybody stand up and show their solidarity for this community is inspiring and powerful and I think it's going to show the administration that the path they are walking is a path America will not accept." Trump protesters at the Portland International Jetport Sunday. By 11:30 Sunday morning, more than 150 protesters had gathered at Bangor International Airport. "I am not a U.S. citizen. I am on a visa," said Yeang Chng, a medical doctor and radiology specialist with Eastern Maine Medical Center. Not only is Chng not an American citizen, but he's from a Muslim country: Malaysia. Chng is married to an American citizen, and has two children who are also citizens, but he says with orders like the one Trump just signed, he doesn't dare leave the country. "Originally, we had planned to go home to visit my family and show them our newborn child, but now I'm completely apprehensive, because I'm not sure if I can even come back in." Chng said the situation is especially bitter, since he came to Eastern Maine to help fill a need for more medical care in the region. "Instead, I feel like a prisoner," said Chng. Protesters rally at the Bangor International Airport Sunday against Trump's refugee ban. Dina Yacoub Agha comes from one of the the banned countries: Syria. She said she earned her citizenship just the day before the presidential election in November. Among requirements for those seeking citizenship is a working knowledge of American history and an understanding of the Constitution. Yacoub Agha said she knows what America is about and feels betrayed. 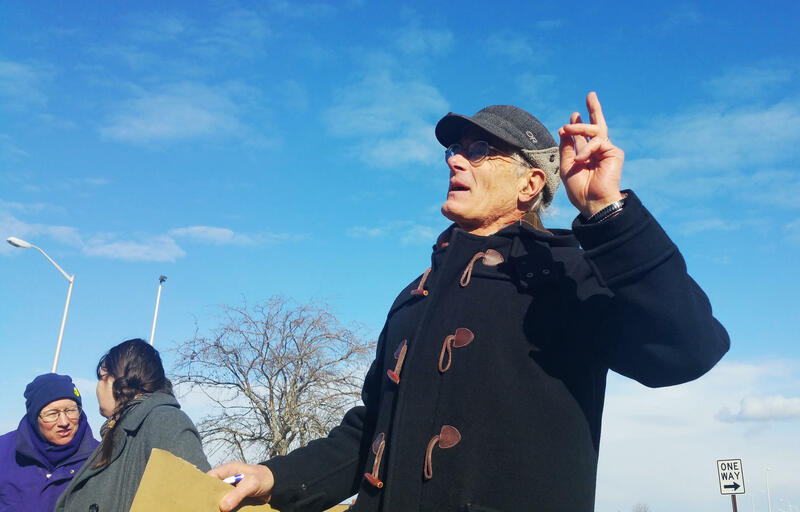 "It's against what America stands for and we need to stand up, we need to fight it," said Yacoub Agha, "because if we are silent, it's going to be another dictatorship. We need to fight it because we don't want a dictatorship. We want the America that's equal, that everyone is welcome, and everyone can practice freedom of speech, his freedom of religion, and to celebrate this country. This is against everything the American Constitution is about." Due to the executive order, Yacoub Agha, who has been in Maine for 10 years, is uncertain about when she will be able to see her family in Syria again; a planned trip this summer may need to be canceled, she said. One protestor yelled, "There are two kinds of Americans! Native Americans and immigrants!" State Sen. Geoff Gratwick, a Bangor Democrat, at Sunday's rally at the Bangor International Airport. "This is a state that really needs outside blood," said Bangor state Sen. Geoff Gratwick, "And the immigrant community, of which we're really all a part, has a great role to play, as you know, at the university, the medical establishment, and in all areas of our life here, there are lots of people who have immigrant backgrounds." The group also drew support from Bangor City Council Chair Joe Baldacci, who is vocal about his own Lebanese and Italian background. Protesters also rallied in front of Portland City Hall, urging Maine U.S. Sen. Susan Collins, a Republican, to oppose the refugee ban and other Trump policies. In an interview with Maine Public Radio Sunday, Sen. Susan Collins said she is not surprised that people are upset at the executive order. She said she believes the stay issued by the judge was appropriate because it's clear, sshe said, that the order had not been vetted by the usual channels to make sure that it was not overly broad and that it was workable. Collins said she believes it is likely unconstitutional. "There should never, never be a religious test for refugee status," she said. "And people practicing a particular religion should not be subject to a higher burden of proof than those who adhere to another religion." Protests were also planned for other small, municipal airports in Maine, such as the one in Belfast.